It's a good article if you ignore the headline. Washington DC - B.J. Guillot, Republican in Washington State's 2nd Congressional District, who has launched a campaign against incumbent Democratic Representative Rick Larsen, attended the Bitcoin in the Beltway conference this past weekend in Washington DC. Mr. Guillot participated in the "Bitcoin and Politics" panel discussion on Sunday along with co-panelists Jacob Farber and Zachary Silva. Farber, Senior Counsel, Perkins Coie LLP focuses on virtual currencies. Silva is a Regional Representative from the Libertarian Party of Florida. The hour long panel covered a wide array of topics related to virtual currency campaign donations and the current interpretations of FEC, IRS, and FINCEN guidance and rules. One anonymous audience member likened Bitcoin treatment to the wave-particle duality concept from quantum mechanics: "Is it currency or property? It's both." The IRS and FEC consider virtual currencies to be property subject to capital gains treatment, whereas FINCEN considers it currency subject to "money transmitter" regulations. This discrepancy makes it very difficult for individuals and business owners to understand which laws to follow and how to properly file taxes because the two interpretations are not reconcilable. While Guillot has been accepting Bitcoin donations on his campaign website for more than a month, the networking opportunities at the conference permitted him to accept in-person digital donations from numerous individuals for the first time. Guillot commented, "It was incredibly easy to transfer Bitcoins from donors to the campaign account. You just show the Bitcoin address on the smartphone as a QR code, the donor points their phone's camera at your screen, and bingo, their digital wallet instantly transfers the Bitcoins to you." "Bitcoin can provide a quick and easy way for people to donate to their candidates and ensures transparency. 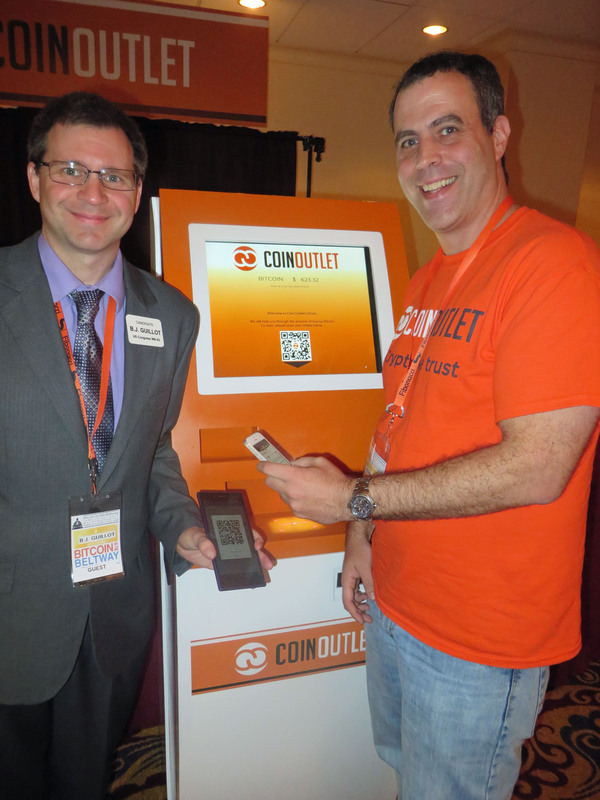 CoinOutlet is happy to provide the means for everyone to be included in this process," said Eric Grill, CEO of CoinOutlet. Blake Carpenter of blakechain.com, @BlakeChain, said "I am just one of many early adopters of Bitcoin who are excited for the opportunity the digital currency offers for easy, uncensorable political speech. Candidates who don't accept Bitcoin are missing out on a huge opportunity." Dean Masley, President of the University of Delaware Bitcoin Club, said "When a candidate for office states they accept bitcoin; they recognize a growing discontent with the existing financial institutions. While that may seem trivial, the Occupy Wallstreet movement was an example of frustrated citizens who felt their opinions were not being listened to. It's great to see candidates being so open to the ideas being presented by such ambitious and talented individuals." Due to unclear guidance recently released by the FEC, congressional candidates are only able to accept Bitcoin donations from individuals of up to $100. Until the FEC can clarify their position on virtual currency, larger donations must be paid by check, credit card, or PayPal. As an individual, Guillot has been an active Bitcoin miner for the past year, starting originally with standard desktop computers, but now using special purpose ASIC equipment from various manufactures including KnCMiner and Spondoolies-Tech. Guillot graduated from the University of Houston in 1999 with degrees in Computer Science and Mathematics and lives in Marysville, Washington with his wife. The references to specific individuals, organizations, and products do not imply endorsement or support by B.J. Guillot for Congress, and vice versa. 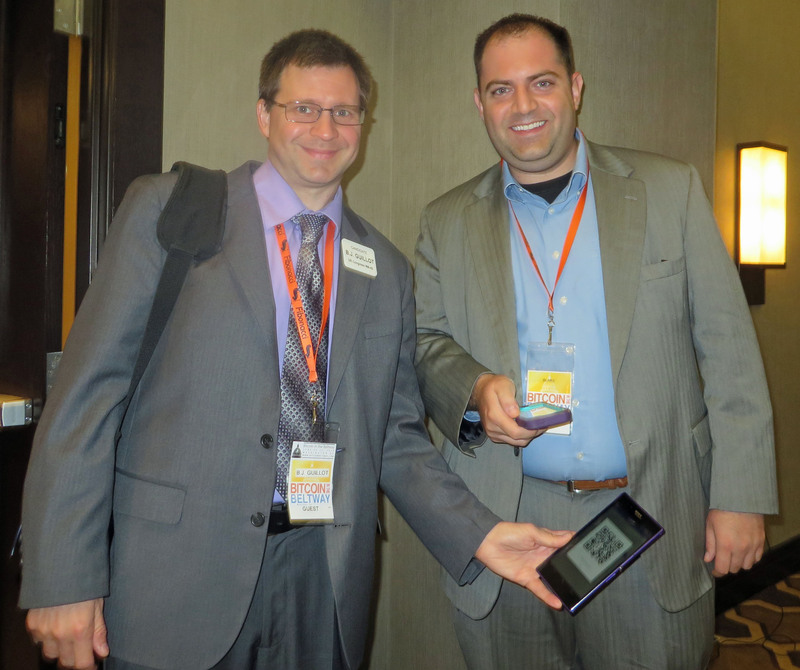 Image #1 - Eric Grill, CoinOutlet CEO, (right) sending a Bitcoin campaign donation to B.J. Guillot (left). Standing in front of the CoinOutlet Automated Coin Transaction Machine kiosk. Image #2 - Blake Carpenter, blakechain.com @BlakeChain, (right), sending a Bitcoin campaign donation to B.J. Guillot (left). Marysville WA - B.J. Guillot, a Republican candidate challenging incumbent Democratic Representative Rick Larsen in Washington State's 2nd Congressional District, announces he will cosponsor the FairTax Legislation, HR 25, upon being elected. The FairTax is a national consumption tax on new goods and services collected at the retail level. Guillot asserted, "The current 74,000 page tax code, its complexity, and the IRS are the problem. The FairTax is the solution." The FairTax has zero exemptions and zero loopholes, closing the door for lobbyists. Instead, it has a monthly "prebate" that "untaxes" every American up to the poverty level. The amount of the prebate is determined by the number of people in the household, not on the household income. For example, a couple with two children would receive a monthly prebate check of $595. In addition, workers would see an increase in take home pay, as deductions for Social Security, Medicare and Federal Withholding would no longer taken out of each paycheck. Mr. Guillot, commenting on the benefits said, "The FairTax is the best proposal available for comprehensive tax reform. It encourages saving and investment, leading to job creation and economic stimulation. Furthermore, undocumented workers would automatically pay into the system any time they make a purchase, but without being a legal Social Security card holder, such workers would be ineligible for the monthly prebates which, I believe, would discourage illegal immigration. Even drug dealers and pimps would pay taxes anytime they purchase new goods." Jamie Wheeler, former Congressional Candidate and 2009-2012 Washington State Director for FairTax Legislation, said "I'm excited to hear of a WA State Congressional District Candidate endorsing and pledging to cosponsor the FairTax bill upon being elected! While FairTax organizations cannot endorse candidates, individual supporters can, and candidates can always endorse the FairTax! This country's economy needs a turn around and candidates for the FairTax tax reform will help turn this economy around." Marysville WA - B.J. Guillot, Republican in Washington State's 2nd Congressional District, who has launched a campaign against incumbent Democratic Representative Rick Larsen, is now accepting Bitcoin campaign donations. Due to unclear guidance recently released by the FEC, the campaign is only able to accept Bitcoin donations from individuals of up to $100. Until the FEC can clarify their position on virtual currency, larger donations must be paid by check, credit card, or PayPal. "One of the reason's I'm in this race is because the IRS unfairly considers Bitcoin to be property rather than currency," said Guillot. This distinction means all virtual currency transactions are subject to capital gains and losses which require tedious cost-basis calculations to ensure that one's taxes are being done correctly. Guillot continued, Congress needs to take a serious look at the 'Virtual Currency Tax Reform Act' that has been submitted by Texas Representative Steve Stockman". 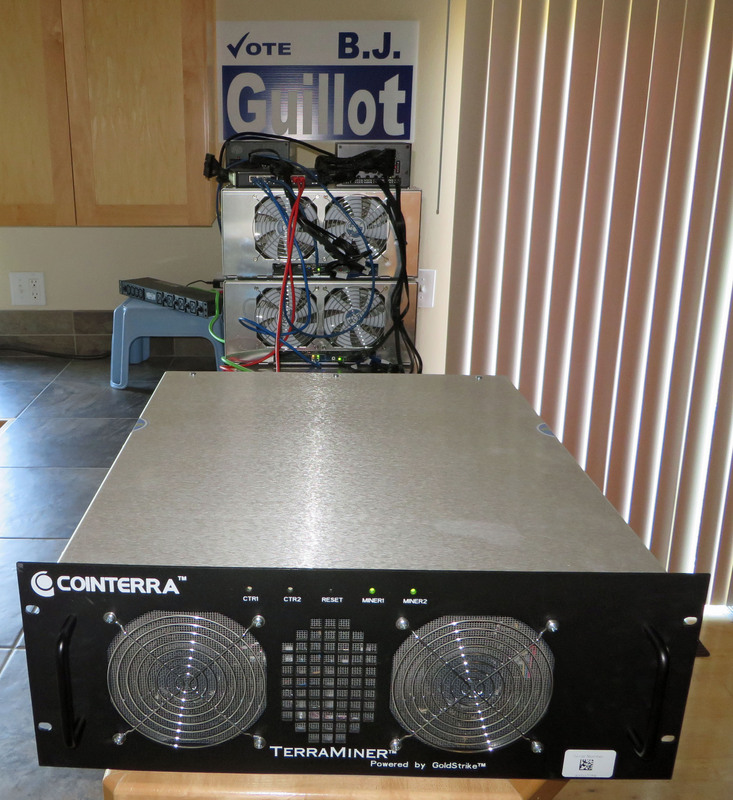 As an individual, Guillot has been an active Bitcoin miner for the past year, starting originally with standard desktop computers, but now using special purpose ASIC equipment from various manufactures including Cointerra, KncMiner, and Spondoolies-Tech. Currently hashing at over five terahash per second, the BitMinter pool's Live Statistics Board, at various times, has even placed him as the 15th fastest participant (name "bguillot"). Guillot graduated from the University of Houston in 1999 with degrees in Computer Science and Mathematics and lives in Marysville, Washington with his wife. Image - Bitcoin Mining Rigs.